When I was a child, the limit of my area was the railway bridge. Running beside the railway was Waterhouse Lane, where I did natural history projects for school, like collecting autumn leaves, nuts and berries. Sometimes I would go up the embankment on wobbly stone steps – you could do that, then, go near the line. Children of my generation were unlikely to throw themselves under trains, or even fall under them as they thundered past trailing stinky smoke. We went up the embankment, I suppose, to feel the rush of the train as it marked the boundary between our small town called Wickford and the village of Shotgate. I don’t remember the trains. What I remember is that under the third step from the top lived the King of the Slow Worms, and that we had to pay him obeisance at that place. I’ve no idea what word a seven-year-old used to mean obeisance, or how many generations of seven-year-olds had passed the knowledge of the Slow Worm on. Presumably they did not predate the railways, unlike crying ‘fenance!’ when you wished to give up in some mock battle – that had been carried across from jousting by children since the fourteenth century. So that was the edge of my childish life in which I possessed all bits of woodland or scrub between our house and the stone of the Slow Worm King. I had dens up roadside banks, between fields, on undeveloped land – anywhere where plants just grew all by themselves. They were my secret world of inviolable privacy where I used to sit and think up stories or make whistles out of cowparsley stems. These days we keep children away from railway lines. A year or so ago, Network Rail put up a horrid aluminium fence along the eastern edge of the Common. Since then, I’ve been willing the trees on the far side to push through and hide the fence, which is an eyesore. They’ve been doing well but yesterday they were all felled. No, ‘felled’ is too good a word. It speaks of woodland management – a kind of kosher tree-killing. This was not felling, it was grubbing. It sounded like a strimmer when I went out to go to the post office in the upper village, but as I crossed over the railway bridge I saw what was happening. A mechanical digger was clawing up the trees and feeding them into a shredder. It was about five seconds from living plant to woodchips. This is April. Those trees and shrubs were full of nesting birds. Voles, slow worms and grass snakes lived in the litter where Jack in the Hedge, cleavers and cowparsley were just pushing through, making a fresh green carpet between the Common and the railway track. The trees had survived a harsh winter and were just coming into leaf. I went down again in the evening, after the workmen had gone, to pick up budded twigs and willow catkins to put in a vase, and to collect hardwood cuttings to plant somewhere surreptitiously sometime. Most of the debris had been cleared by the shredder, leaving the orange stumps of very old, large willows showing their wounds to the sky. Some branches hung over the fence like soldiers on barbed war in the First World War. The fresh sappy green of new hawthorn had gone, leaving a mass of wilting, lusterless new leaf. Catkins hung limp and lifeless. This was Avatar in our own backyard. I collected my twigs and, finding my way back blocked by curious horses looking for something to nibble, had to negotiate my way home. I felt like hugging everything. 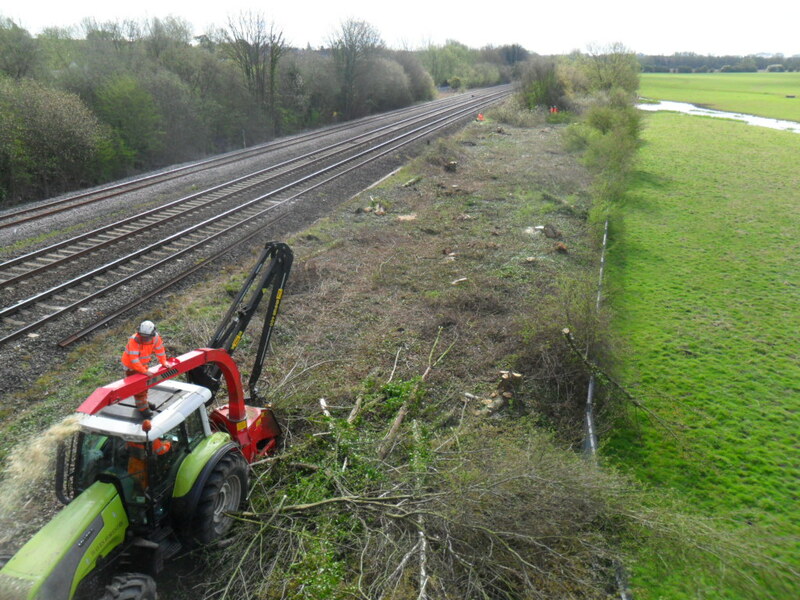 The ground is being cleared to make way for extra railway track. We’d heard they’re wanting to raise bridges to allow for double-decker containers, but no-one mentioned new track. Why April? Why not February? The trains run past now bald on the horizon, nothing masking the view. As I sit here at my desk at night, I can see the upper village and its lights very clearly. Everything has changed. They say the new track will be laid from here to Trap Grounds. That means they will be clearing ‘scrub’ right along the eastern edge of the Common. That means my blackthorn is next in the line of fire. I first met it round about this time last year, when the full moon was in perigree (see the post ‘Green thoughts in a greening shade’, March 20, 2011). I was at a neighbour’s house, on their balcony, to see the event, and the moon took a long time rising – time in which to enjoy the dusky view. The darker it got, the more ghostly a tree of early blossom standing out on the boundary. ‘Blackthorn,’ I was told, ‘is the first to flower.’ I’ve since learnt, in this year of waking up again to what’s around me, that sloes grow on blackthorns. 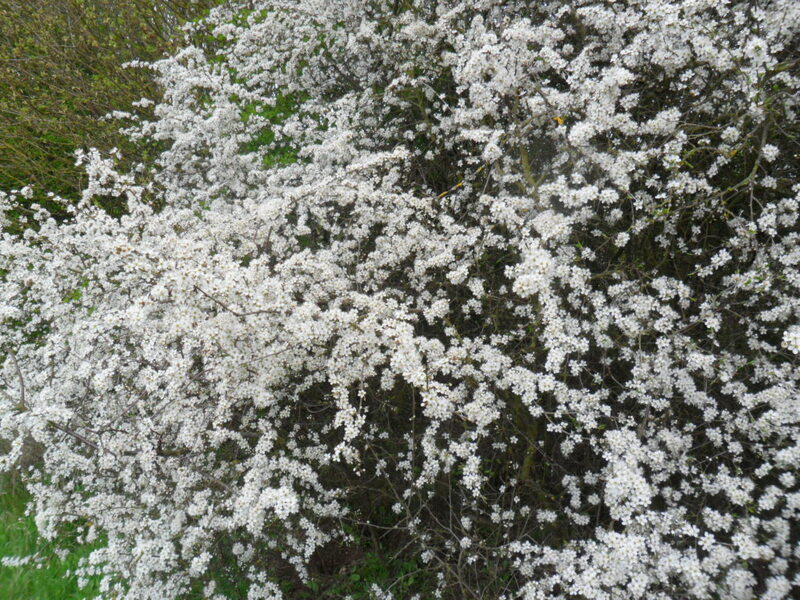 Keen to try a recipe for sloe and marrow jam, I’ve been out and about noting where the blackthorns are. This one, above which the full moon in perigree eventually rose , I went to commune with when its flowers came out a month ago. I stood beneath it and let it rain down blossom on my face. Tomorrow it will be dead. All I can do is to go out early and get a cutting before the machines come. Reading last year’s post, I’m reminded that blackthorn makes good wands for witches. Perhaps I’ll magic it all back again with my hardwood cutting. How sad, Linda! I will pray that your cuttings will take root and the tree will sprout anew in another, safer, place. When I opened up the coldframe this morning, all the wilted leaves and buds looked perky. It’s not the same as taking root, but it was a very hopeful sight. The ones in the vase are to be banished outside, however, as the living room is full of floating willow seed!